LEATHER BARREL CASE, FLEECE LINED. LENGTH: 34". SINGLE SHOTGUN CASE, COWHIDE LEATHER, FLEECE LINED. LENGTH: COMES IN 51" AND 54". SINGLE SHOTGUN CASE, COWHIDE LEATHER, FLEECE LINED. SOFT LEATHER CASES,FLEECE LINED . 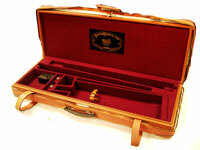 LENGTH: 53"
SINGLE SHOTGUN CASE, LEATHER, LINED. LENGTH: 51". MADE IN ITALY. SINGLE SHOTGUN CASE, FLEECE LINED. LENGTH: 50". SINGLE SHOTGUN CASE, LEATHER . SINGLE SHOTGUN CASE,CANVAS, LEATHER TRIMMED. LENGTH: 50". SINGLE SHOTGUN CASE,CANVAS, LEATHER TRIMMED, SIDE POCKET. 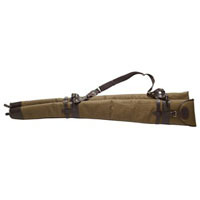 LENGTH: 50"
SINGLE SHOTGUN CASE,CANVAS, LEATHER TRIMMED, FLEECE LINED. 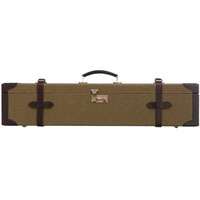 SCOPED RIFLE CASE,COWHIDE LEATHER,FLEECE LINED. LENGTH: 48 1/2". TAKE-DOWN SHOTGUN CASE, LEATHER TRIMMED, FLEECE LINED . LENGTH: 32". TAKE-DOWN SHOTGUN CASE, COWHIDE LEATHER, FLEECE LINED . LENGTH: 32". 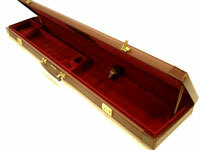 DETACHABLE DOUBLE SHOTGUN CASE, COWHIDE LEATHER, FLEECE LINED . ONE PIECE DOUBLE SHOTGUN CASE, COWHIDE LEATHER, FLEECE LINED. ONE PIECE DOUBLE SHOTGUN CASE, CANVAS, LEATHER TRIMMED, FLEECE LINED. LENGTH: 51"
SIZE: 31 3/4" LONG, FITS 30"
SIZE: 32 3/4" LONG, FITS 31 1/2"
SIZE : 3 1/2" X 9" X 32 1/2"
SIZE: 3 3/4" X 9" X 32 1/2"
BERETTA GUN CASE WITH LEATHER TRIMMING, MAXIMUM BARREL LENGTH: 29 1/2"
METAL GUN CASE, AVAILABLE IN A VARIETY OF DIMENSIONS TO HOLD ONE OR TWO GUNS. COMBINATION LOCKS.